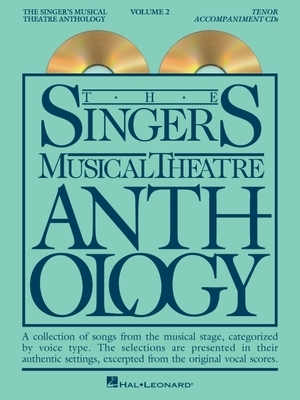 The Singer's Musical Theatre Anthology - Volume 2 (Singer's Musical Theatre Anthology (Accompaniment)) (Hardcover) | The Drama Book Shop, Inc.
(Vocal Collection). Two accompaniment CDs in each package which match the books containing a collection of songs from the musical stage, categorized by voice type. The selections are presented in their authentic settings, excerpted from the original vocal scores. Contents: THE APPLE TREE: Forbidden Fruit * BEGGAR'S HOLIDA: Maybe I Should Change My Ways * BELLS ARE RINGING: I Met a Girl * CABARET: Wilkommen * CALL ME MADAM: Once Upon a Time Today * CAROUSEL: Geraniums in the Winder * CHESS: Anthem, Where I Want to Be * THE DESERT SONG: Margo * DO RE MI: I Know About Love, Asking for You * EVITA: High Flying, Adored, On This Night of a Thousand Stars * FANNY: I Like You * FIDDLER ON THE ROOF: Miracles of Miracles * FINIAN'S RAINBOW: Old Devil Moon * FLOWER DRUM SONG: Like a God * FOLLIES: Beautiful Girls * GODSPELL: All Good Gifts * GOOD NEWS: Lucky in Love * GRAND HOTEL: Love Can't Happen, At the Grand Hotel * GREASE: Alone at the Drive-In Movie * GUYS AND DOLLS: Sit Down You're Rockin' the Boat * HOW TO SUCCEED IN BUSINESS WITHOUT REALLY TRYING: I Believe in You * JEKYLL AND HYDE: This Is the Moment * JESUS CHRIST SUPERSTAR: I Only Want to Say (Gethsemane) * JOSEPH AND THE AMAZING TECHNICOLOR DREAMCOAT: Close Every Door * MILK AND HONEY: I Will Follow You * LES MISERABLES: Bring Him Home * MISS SAIGON: Why God Why? * THE MYSTERY OF EDWIN DROOD: Jasper's Confession * OLIVER : Boy for Sale * ON A CLEAR DAY YOU CAN SEE FOREVER: She Wasn't You * THE PHANTOM OF THE OPERA: Music of the Night * PLAIN AND FANCY: Young and Foolish * THE SECRET GARDEN: A Bit of Earth, Winter's on the Wing * SHE LOVES ME: Tonight at Eight, Tango Tragique, She Loves Me * THE STUDENT PRINCE: Serenade.